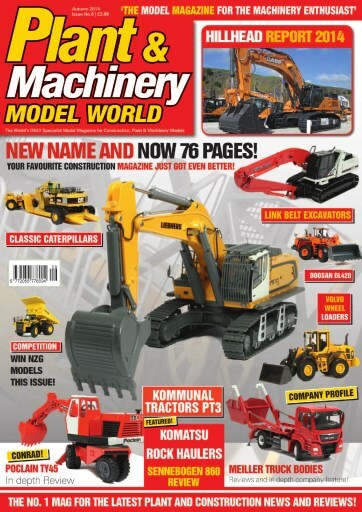 Some big changes have happened to the magazine over the summer, as you may have already noticed from the new title, “Plant & Machinery Model World”. IGP-Ltd now have three dedicated model magazines in the portfolio including Model Farmer for all agricultural related news and reviews alongside Truck Model World which covers the world of diecast replicas & 1:24th scale model kits, scratch built replicas and remote controlled models of trucks & commercial vehicles. 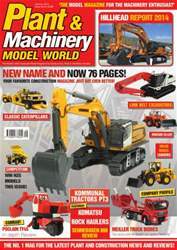 Going forward, Plant & Machinery Model World will focus 100% on models and replicas of construction, mining, lifting and related equipment over 76 feature packed pages offering all the usual news and reviews you are already used to along with new topics including a recurring section featuring scratch built models that highlight the amazing skills of individuals to create truly stunning replicas of equipment not available commercially. In this issue, we highlight the work of Zeger van Hattem with his 1:24th scale Volvo EC460C tracked excavator. The summer has seen some interesting new model releases, most notable are the massive 1:50th scale Liebherr R9800 hydraulic excavator in backhoe configuration from Conrad which gets a once over while the Liebherr R970 SME is a great release from WSI Models and has already made my list of the top 3 models of 2014. Tonkin Replicas have been busy creating a new range of 1:50th and 1:87th scale Caterpillar models which I take a closer look at and the Volvo model fleet has received a number of new additions in 2014 which are put under the microscope, as are the latest Komatsu models from First Gear and NZG.